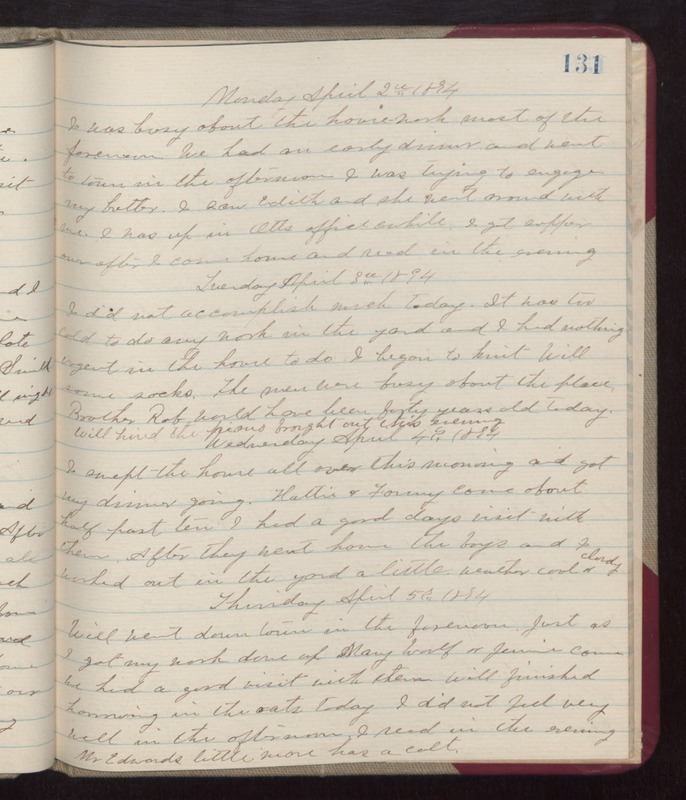 Monday April 2nd 1894 I was busy about the house work most of the forenoon. We had an early dinner and went to town in the afternoon. I was trying to engage my butter. I saw Edith and she went around with me. I was up in Otts office awhile. I got supper over after I came home and read in the evening. Tuesday April 3rd 1894 I did not accomplish much today. It was too cold to do any work in the yard and I had nothing urgent in the house to do. I began to knit Will some socks. The men were busy about the place. Brother Rob would have been forty years old today. Will hired the piano brought out this morning. Wednesday April 4th 1894 I swept the house all over this morning and got my dinner going. Hattie & Fanny came about half past ten. I had a good days visit with them, After they went home the boys and I worked out in the yard a little. weather cold & cloudy. Thursday April 5th 1894 Will went down town in the forenoon. Just as I got my work done up Mary Woolf & Jennie came we had a good visit with them. Will finished harrowing the oats today. I did not feel very well in the afternoon. I read in the evening. Mr Edwards little mare has a colt.